On June 28, 2012, CDS partners- along with 17 other businesses - celebrated our graduation as part of the inaugural class of the Creative Ventures Program. Creative Ventures, sponsored by Detroit Creative Corridor Center (dc3), is a year-long business development program for creative sector entrepreneurs, such as architects, performing artists, web designers, and others growing their businesses in Detroit. Centric Design Studio strives to be a key architectural firm for sustainable urban revitalization in post-industrial cities like Detroit. We recognized the value of networking, collaborating, and being guided by people in the creative community. 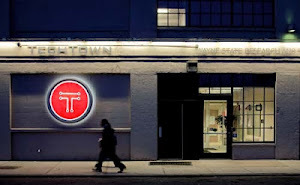 Although Creative Ventures is housed in the College for Creative Studies in Midtown Detroit, we continued to work out of our offices in TechTown while still utilizing the services offered by the program. We were guided by a business mentor and received assistance and training in sales, marketing and growth strategies. See our other Creative Ventures "classmates" on the dc3 site.